> Extreme Networks > Is A Cloud-Managed Network Right For You? The goal of a Cloud-Managed Network (CMN) is to make deployment, management and control over network infrastructure devices very easy, offset the need for trained IT staff at remote locations or for geographically dispersed organizations, and a CMN provides both OpEx and CapEx savings. Don’t make your decisions in a vacuum, as with anything, do your homework and learn about the many benefits that a Cloud-Managed Network can provide for your business. 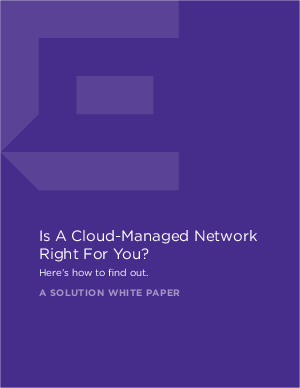 This comprehensive white paper provides you with information needed to successfully guide you through the decision-making process of determining the right network for your business.